Bootie SF: DJ Tripp’s Birthday! San Francisco Bootie SF: DJ Tripp’s Birthday! 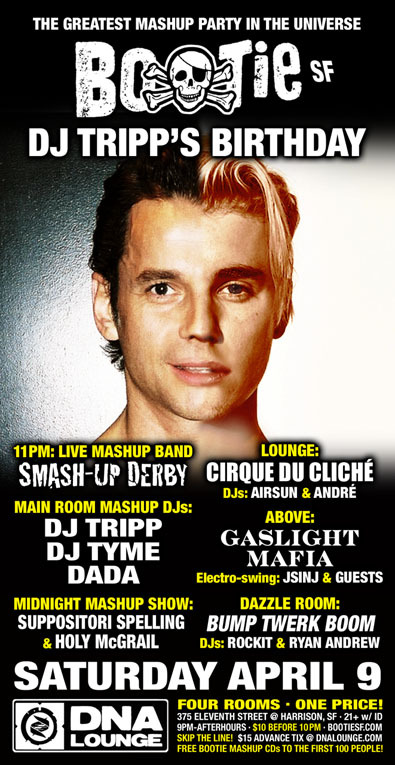 Resident DJ Tripp celebrates his birthday at Bootie with a special feature set, joined in the Main Room by DJ Tyme (of Entyme) and Dada, as they give you the party for his birthday! At 11 PM, house band Smash-Up Derby takes the stage with live rock mashups, and drag hosts Holy McGrail and Suppositori Spelling throw a Trippilicious Midnight Mashup Show! Upstairs in the Lounge, it’s Cirque du Cliché, keeping you bouncing across the dance floor, while Gaslight Mafia takes over Above, manipulating classic swing and jazz with modern sounds and techniques. And in the Dazzle Room, it’s Bump Twerk Boom, making you bump, sweat, and grind with bootie-twerking bass! Plus free Bootie mashup CDs to the first 100 people!